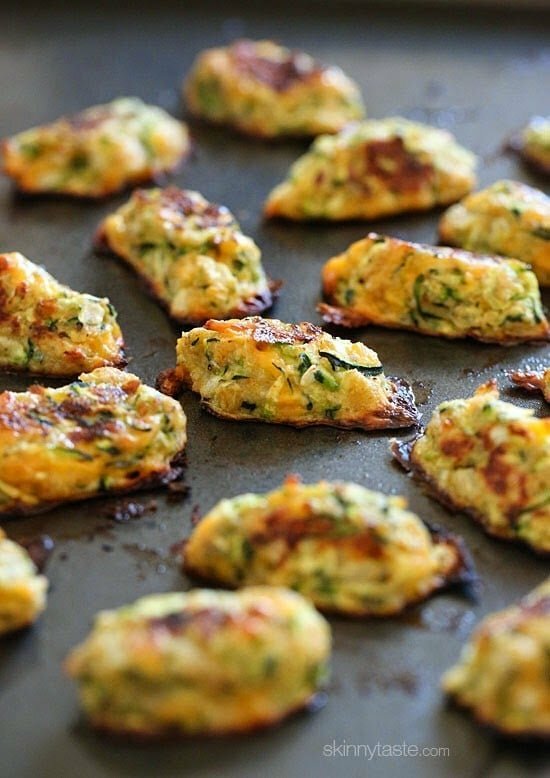 Zucchini Tots are a great way to get your family to eat their veggies! These kid-friendly zucchini tots, made with shredded zucchini and cheese make a great side dish or snack. 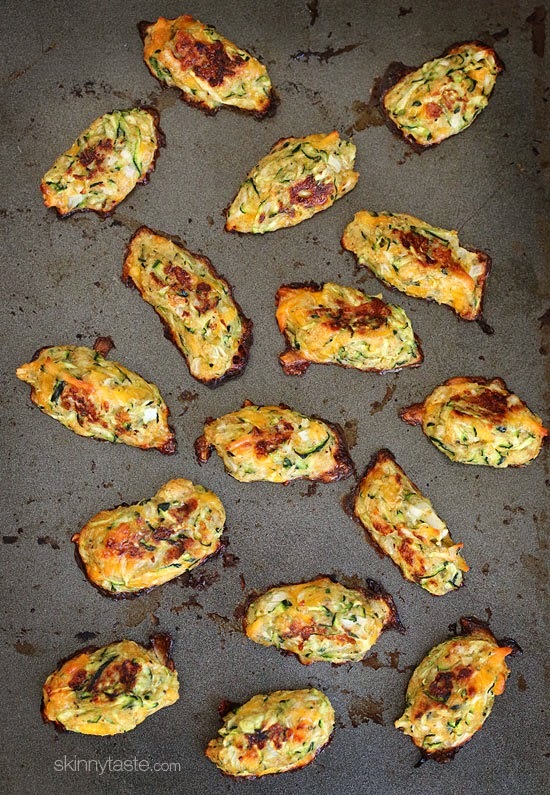 I have tons of zucchini recipes here on Skinnytaste, so many I created an entire Pinterest board called Yummy Zucchini devoted to it. A few of my favorites are Zucchini Enchiladas (perfect for meatless Mondays), Chicken Rollatini Stuffed with Zucchini and Mozzarella, Zucchini Pizza Bites and one of my summer favorite’s – Sausage Stuffed Zucchini Boats. For breakfast you can try this Chocolate Chip Zucchini Bread, even the pickiest of kids will enjoy them! Then last year I made these cauliflower tots and baked them on a baking sheet and they were perfect. So last night I decided to try it out with this recipe, and the results were zucchini tot perfection – no more sticking to the pan! I also like how they got a little crisp on the edges – so good! My husband LOVED these, and he’s pretty particular when it comes to eating zucchini. One advice is to be sure to squeeze as much water out of the shredded zucchini, I just used paper towels. Some moisture will still remain, but they will turn out just fine. Omg! These are soooooo good!! I add extra cheese and sometimes fresh herbs or other seasonings. GINA, I’m a huge fan, insta follower, product refer buyer (insta pot& spiralizer), book buyer, lol! Just wanted to add, when I can’t fill the cup of zucchini, I shred some carrots & if I’m not too hungry or taste testing too much, I cook a bit longer for the extra crunch! I love this recipe! I use panko and add a little more until I can form them in to a tube shape. I plan on freezing some and am wondering how you reheat them after thawing. Thanks so much! Glad you liked them! 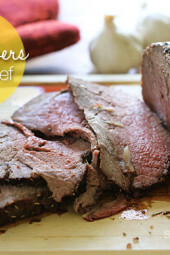 You can use the oven or air fryer. This looks delicious! Can I also cook them on parchment paper over my cooking tray? Any idea what I could substitute for the egg? My son is allergic! I imagine you need to have an alternative for LOTS of recipes! These are really easy and tasty. My 3 year old son even ate them up. Made these, a long with a lot of other zucchini recipes since the garden is doing so well, and was surprised by just how much I liked them. Will be making them again, and again, and again. I made these tonight, i used fat free cheddar cheese. It didn’t stick together like i thought it should so i added a little more bread crumbs. They were so good, so happy i found this recipe. 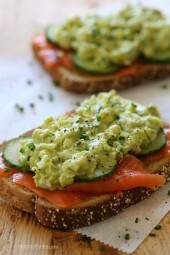 I would suggest to add some dill as well, zucchini and dill are the best friends in Mediterranean cuisine. There is a similar recipe is called ‘mücver’. It is deep fried recipe which is so delicious but I cook it in oven or in a pan to make it healtier sometimes. I love this recipe and all the others on your website. Thank you for taking the time. I was always looking for new ways to cook my food and I love that they have nutritional information. Helps me a lot. I also saw that you or someone else took the time to put a lot of the recipes into MyFitnessPal which makes it even easier to keep track of calorie count and everything else. Made these last night as a side to our dinner, They are absolutely delicious!!!!! Thank you! Just made mine with half carrots half zuchinni, used half almond flour and half bread crumbs. Mozzarrela cheese doubled in quantity, also added oregano thym garlic powder turmeric and they are gorgeous and sooo yummy! I made this the other day and I was skeptical to try them at first but when I did OH MY GOSH were they good! I ended up eating all of them and not feeling bad about it at all haha! Thanks for the great recipe! Walter, “Skinny”taste!! Deep frying them would kind of be counter to the healthy aspects of making them. Anyone tried making these ahead of time and then baking them the next day? Or baking them and then reheating them? Ugh … forgot to ring out the zucchini and mixture is all made. Is it ruined?! 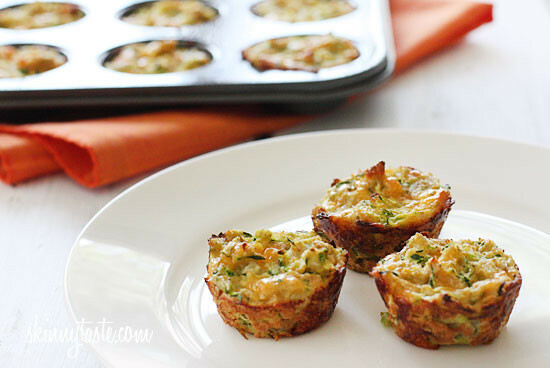 I’m on the 5:2 “diet” and these zucchini tots are perfect for fast days. Delicious & satisfying. I love your recipes, Gina. My husband and I are enjoying our diet because of them. Thank you! I’ve bought both your cookbooks & can’t wait to order the next. Can i put the zucchini in the food processor? will that work? Made these tonight and they are awesome! Picky husband loved them too. This recipe is a keeper. I got a bunch of zucchini in my produce delivery, so I came here looking for recipes, this one sounded awesome and oh wow! It was so amazing! You’d never know these are good for you! I took another commenter’s suggestion and or the shredded zucchini in a strainer with a bit of salt and let that sit while I prepped everything else, then used paper towel to squeeze the water out and they were perfect. Thanks Gina!! Forgive me for seeming lost, but do you measure the packed cup of zucchini before or after you remove the water. Seems like that would make a big difference. Thanks for the help! Ruth Anne, the video show a zucchini-packed measuring cup being dumped into a cotton kitchen towel to then be squeezed out. Seeking input about substitutions . . . Recipe sounds wonderful! Appreciate the prior suggestion about using carrots instead of cheese! I’m thinking of using dried potato flakes instead of bread crumbs and a variety of herbs instead of onions. Would also use carrots instead of cheese. Any thoughts or suggestions? My husband, not typically a zucchini fan, can’t get enough of these! He has any leftovers with breakfast. I’ve been cooking them in the mini muffin tins for ease sprayed with cooking spray and they seem to come out easily and very crispy too. Last time around I ran out of chedder and used a mix of chedder and parmesan. Extra yummy! Regarding squeezing out as much liquid from the zucchini as possible try these two methods. 1) Use a Nut Milk bag which can be purchased at Amazon for under $10 or 2) Wring out in a kitchen towel; for best results use a flour sack or thin muslin cloth. 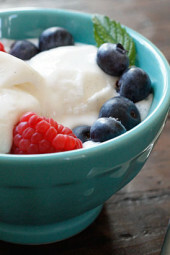 I really wanted to have some for breakfast, but these are so good that we didn’t leave any! Really, really good! I used parchment paper without the oil, they came out nice and crispy. I didn’t have seasoned breadcrumbs so I did what someone else suggested and added some oregano. Yummy! How many are considered 1 serving ? Or how many ounces ? The recipe says 5 tots is a serving size. Next time I’ll use half seasoned breadcrumbs and half regular breadcrumbs. 1/3 Cup seasoned is way too salt for me (but maybe Dutch seasoned breadcrumbs are much salter….?). I skip the onion and replace the breadcrumbs with crushed seasoned croutons. Delish! Has anyone tried mixing in some shredded hash brown potatoes? Could you air fry these? Time? I air fried these at 450 for like 7-8mins per side and they came out very crispy/perfect! Any way to do these gluten free? Would almond flour exchanged for the breadcrumbs be think enough? Thanks! There are gluten free bread crumbs…or you can make your own with gluten free bread. Probably my favorite recipe on this site! I love tater tots and really appreciate this healthy variation. I make a slightly larger tot — 12 per recipe — and cut back the serving size to 4 pieces. Thank you, Gina! Can these be made in advance and baked off later? You can also use parchment paper on your baking sheet for easy cleanup! Can I leave out the cheese and replace it with something else, maybe another vegetable? I’ve done these and left out the cheese all together. I’ve also replaced it with carrots. Mine came out too runny. Any solution? Try wringing more moisture oit of the zucchini. Try wringing more moisture out of the zucchini. SILLY QUESTION… WHAT DO YOU DIP THESE IN? TOMATOE SAUCE OR KETCHUP? They’re wonderful dipped in thousand island dressing. I like them with a tangy barbecue sauce. They were mmm in remoulade but what isn’t? Any substitute for breadcrumbs? I’m trying to avoid carbs. Try cauliflower? Not sure of the consistency but even if they fell apart I bet it would be good. I use Joseph’s flax, oat bran, and whole wheat pitas. Dry them out a bit, then process in food processor. Each pita is only 4 net carbs! I was just wondering how that would work. I bet seasoning and toasting it a bit instead of just drying would add to the breadcrumb texture and taste. I would try coconut or almond flour! This is a really awesome dish! Its a perfect recipe for a quick and easy finger food idea!, Really creative and full of flavor too. Its really interesting to serve fingers foods to parties, especially if its got huge flavors inside despite a small serving. I usually serve finger foods together with a safe plastic toothpicks and a cute Whale toothpick holder! Is it possible to freeze without it becoming soggy as I defrost? We are freezing ours! Works great because my zucchini plants are putting out zucchini like made. I’ve got two gallon bags full so far. I do cook them a little longer on each side. (12 minutes per side).